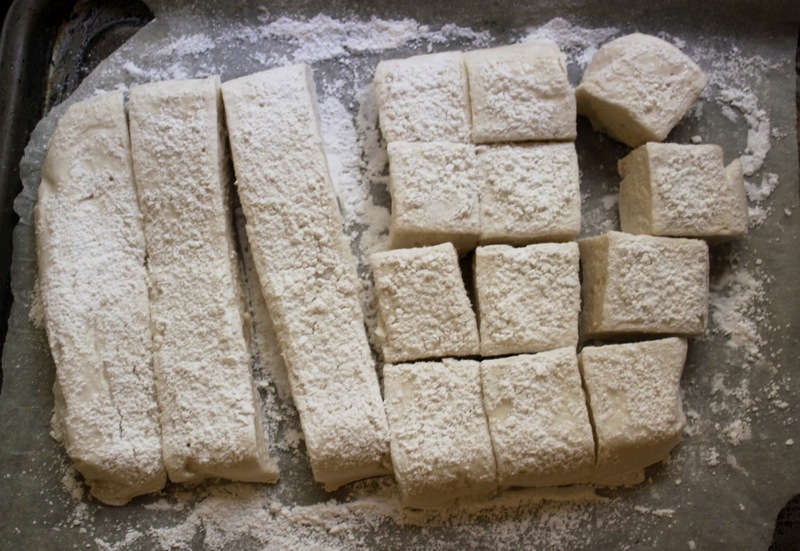 While I was putting together this post, I did some research on homemade marshmallows as I was curious to see whether anyone else had tried making marshmallows using flax seed ‘meringue’ and posted about their results. Other than a whole plethora of websites with recipes for homemade hairgel and styling products for curly hair made with flax seeds (maybe I should look into this? ), the only recipes for marshmallows made without egg whites I came across were made simply with corn syrup – something I understand is fairly typical in the US. Given that these flax seed ‘meringue’ marshmallows could easily be mistaken for the real thing (and some have said that the texture of the corn syrup marshmallows is not as fluffy as those made with egg whites), I decided it was time to post about them. And no, I haven’t suddenly gone vegan, but I am intrigued by how flax, this cheap and simple ingredient, can be used in so many recipes traditionally requiring whipped egg whites. And although I haven’t gone vegan, I have been playing a lot with this new technique, so expect a few more posts on flaxseed meringue coming your way! Note: Do not try to make the marshmallows whisking by hand, unless you have some superpower upper arm strength – the flax seed meringue takes a lot longer to whip (10-15 mins. for soft peaks) so be kind to yourself and use an electric mixer, even better a stand mixer if you have one. As always, marshmallows are the perfect canvas to let other flavours shine, my favourite flavours for the colder months are cardamom (amazing with a shot of espresso), gingerbread or orange zest for chocolate covered marshmallows). 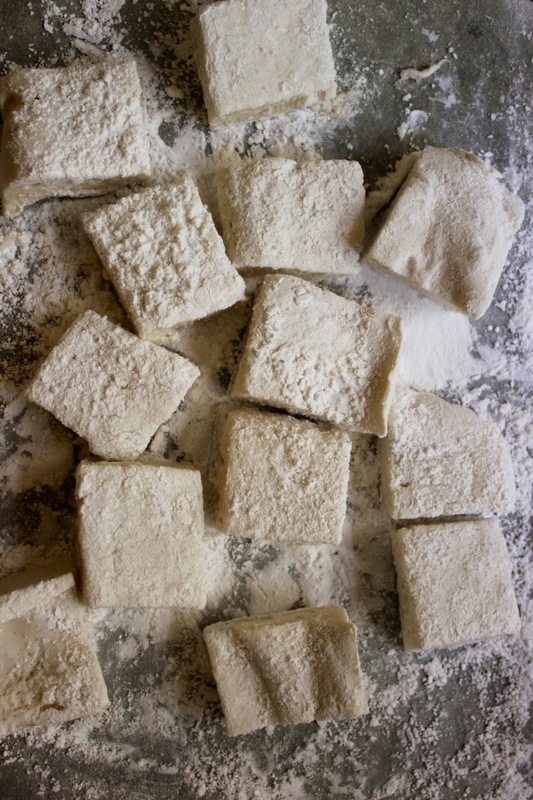 These marshmallows can be made vegan by using agar agar instead of gelatine. 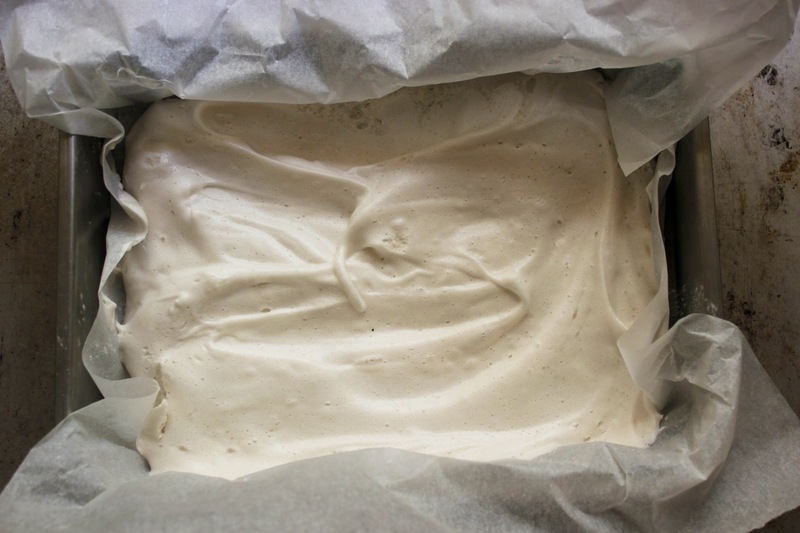 A recipe for vegan marshmallows using flax seed meringue can be found here. 1. Prepare a baking tray lined with greaseproof paper and dusted with a thin layer of the enrobing mixture. 2. Place the sugar and water in a pan and place a candy thermometer in the pan and soak the gelatine in cold water. 3. Beat the flax seed gel for ca. 5 minutes on high by which stage it should be whiteish in appearance and foamy but still liquid. Bring the sugar and water to a boil while continuing to beat the flax seed meringue on high. Once the sugar syrup reaches 120 degrees Celsius take it off the heat and slowly pour it into the flax seed meringue while continuing to beat the mixture. Once all the sugar has been added, remove the gelatine from its soaking water, squeeze out the excess water and add to the flax seed meringue. Continue beating the mixture until it feels only warm to the touch (ca. 5 minutes). 4. Scrape mixture onto the baking tray, trying to distribute it evenly. 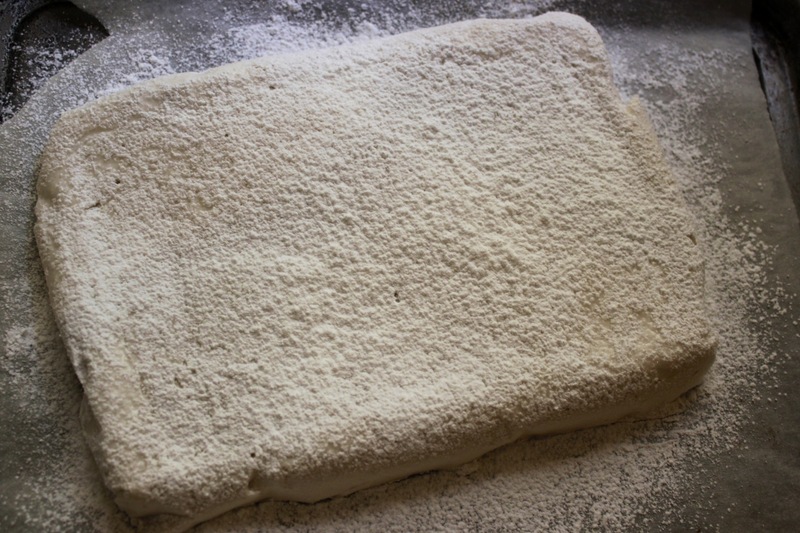 Leave to set overnight or for 10-12 hours before turning the marshmallow slab onto a cutting board covered in a thin layer of the enrobing mixture. Dust more enrobing mixture onto the side facing up before cutting the marshmallows into small squares or any other shape you would like (this is easiest if you use a knife dipped in boiling water and dried with a tea towel, repeating this every so often once the marshmallow starts sticking to the knife). Dust the cut marshmallows in the enrobing mixture, making sure all sides are covered, and store the marshmallows in an airtight tin. Interesting! Thanks for sharing, will be looking forward to your future posts using flax. Thank you – I agree it’s such an interesting technique. Thinking of trying a baked flax seed meringue next, just need to work out the right temperature so it doesn’t collapse!